Product #6200 | SKU H600 | 0.0 (no ratings yet) Thanks for your rating! 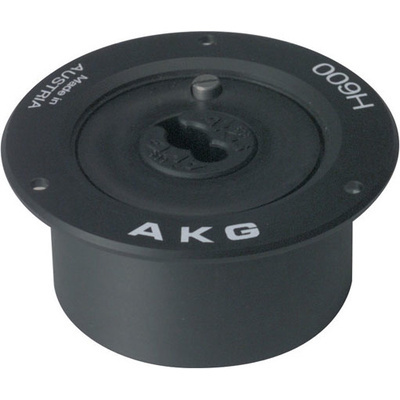 The AKG H 600 shock mount is designed for permanent installation of GN Series E and ES version gooseneck modules from the Discreet Acoustics Modular series. This mount provides maximum attenuation of structure-borne noise (20 dB). Each mount consists of a durable low profile plastic shell with a flexible inner rubber boot, and, for added security, features a locking clutch that prevents easy removal of the gooseneck module. Included with the H600 is the A608 insert. The A608 grips the narrow section of the gooseneck and allows for custom height adjustments. The H600 requires a 2.1 inch (53 mm) mounting hole.